Use the Keylex 500 series on all standard duty, low security internal door installations. Always choose the K2100K option for military, police and fire service installations. The narrow stile Keylex 500 design, with its built-in clutch mechanism protecting the lock furniture, will suit all clear stile widths down to 80mm and is particularly suited for use on timber and composite doors. The Keylex 500 can be expected to give many years’ service if specified and maintained correctly. This lock utilizes an adjustable tubular deadlocking latch (adjustable backset length between 60mm and 70mm) that locks the door every time the door closes. An authorized code is required to override the lock from the outside unless the passage function is set to ‘free’. The door is always ‘free from fixings’ for immediate egress from the inside. All standard Keylex 500 models are supplied complete with outside lock body and inside lever furniture on back plate with free passage turn. 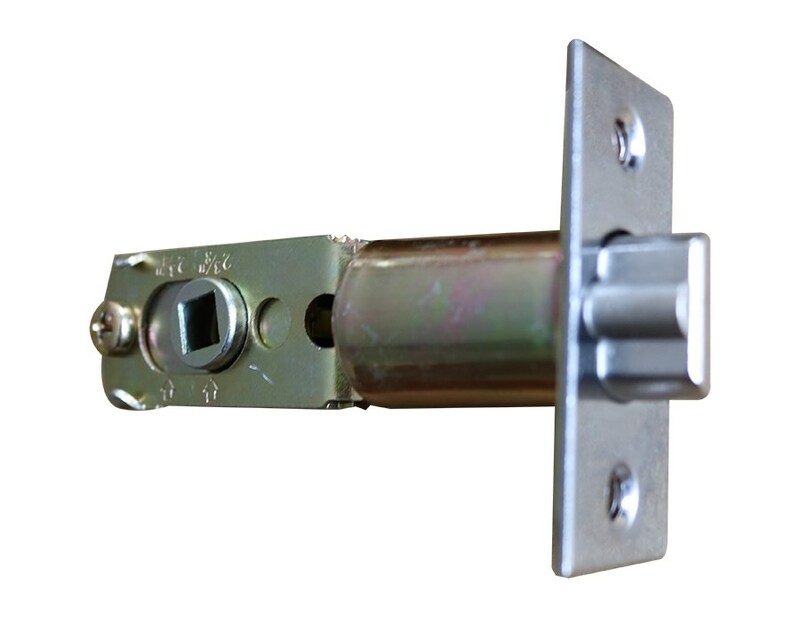 The adjustable tubular deadlocking latch is supplied with the lock and provides backset lengths of 60mm or 70mm. All optional Keylex 500.RIM models are supplied complete with outside lock body and inside turn snib on back plate.The slide bolt is an integral part of the inside furniture. The Keylex 500 suits door thicknesses between 30mm and 50mm standard. Please advise all door thicknesses in excess of 50mm. The Keylex 500 suits minimum clear stile widths of 80mm when used with the standard tubular deadlocking latch - (adjustable backset length between 60mm and 70mm). NB - Stop depths may restrict suitability. Do not use this product on military, police, fire service and other installations where heavy handed use/abuse can be expected. Use this option where the door and frame design dictates that a mortice latch becomes impractical - e.g. where glazed doors will not allow a mortice. This lock utilizes a solid rim mounted slide bolt - necessarily operated by a round knob outside with a turn snib on the inside. An authorized code is required to override the lock from the outside - passage function is achieved via the inside turn snib allowing the door to be left unlocked if required. The door is always ‘free from fixings’ for immediate egress from the inside. The backset length of the Rim Slide Bolt lock is not fixed but is adjustable. This dimension is dictated by the door and frame detail. Doors and frames do not need to be flush on the bolt side since the standard strike will accommodate jamb reveals when turned through 90 degrees.